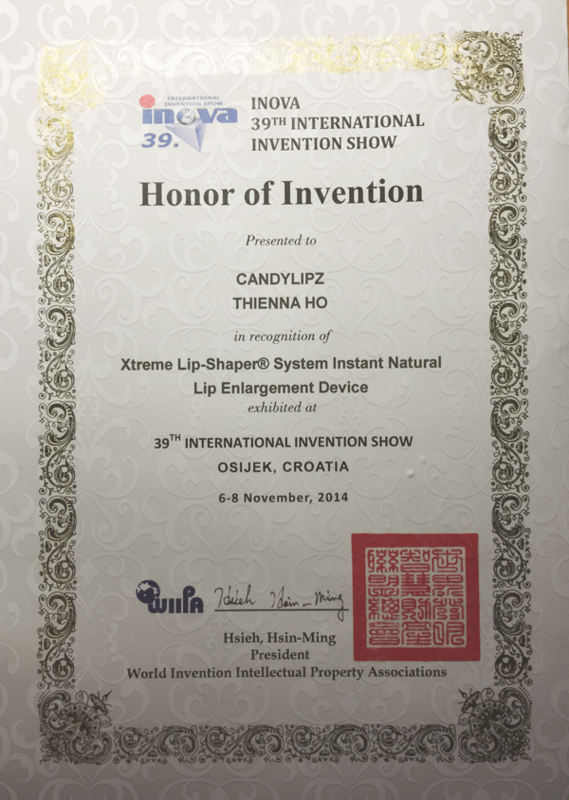 04.2014: CandyLipz A'Design Award Certification-- The First Award Winning Lip Enhancement Device In The World. CandyLipz LLC. took part in the 2015 International Inventor Prize, it's 11th annual edition in which the award ceremony was held on December 14th in Taipei alongside International Innovation & Invention Competition (IIIC). Dr. Thienna Ho, Ph.D., the CEO & Founder of CandyLipz LLC., was awarded the Pride of the Nation Invention Award! 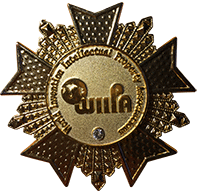 2015 Taiwan International Inventor Prize. to the improvement of human benefits and the advancement of world civilization. The Pride of the Nation Invention Award is hereby issued. WHY CANDYLIPZ TECHNICAL DESIGN IS SO UNIQUE? 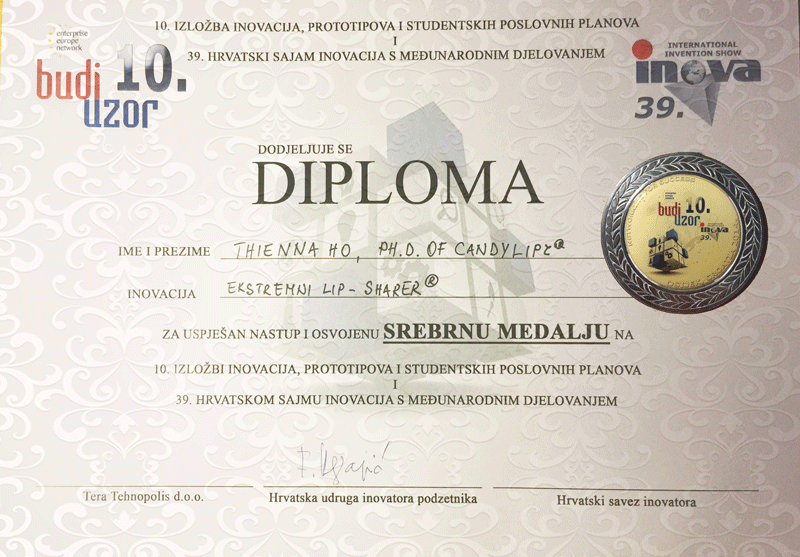 11.2014: NEWS: CandyLipz won 3 additional prestigous awards including: Spark , INOVA, and WIIPA awards. 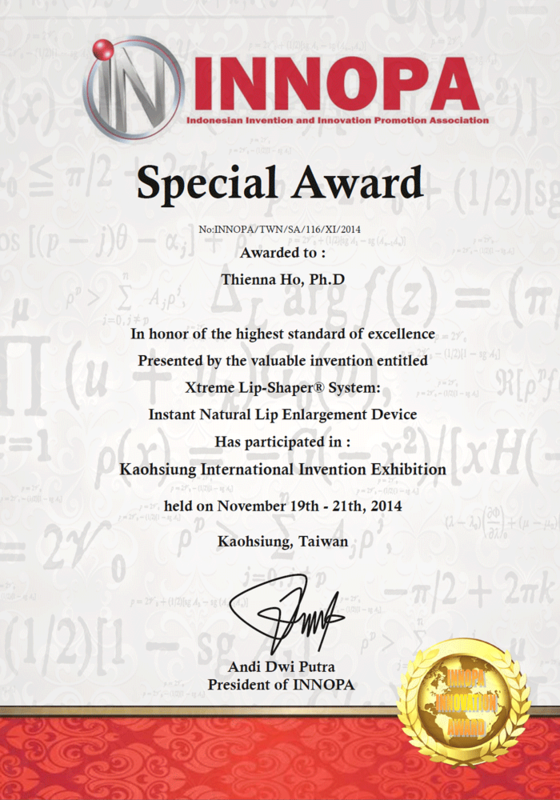 12.2013: NEWS: Xtreme Lip-Shaper System Wins Prestigious A' Design Awards 2013 from Milan, Italy! The motto of the A' Design Awards is "Ars Futura Cultura" i.e. Arts Cultivate the Future, Arts for the Culture of Future. A' Design Awards believe that the future is shaped by arts, design and technology, thus there is need of good design for a better future. The A' Design Award is not just an award, it is the indicator of quality and perfection in design, the award is recognized worldwide and takes the attention of design oriented companies, professionals and interest groups. 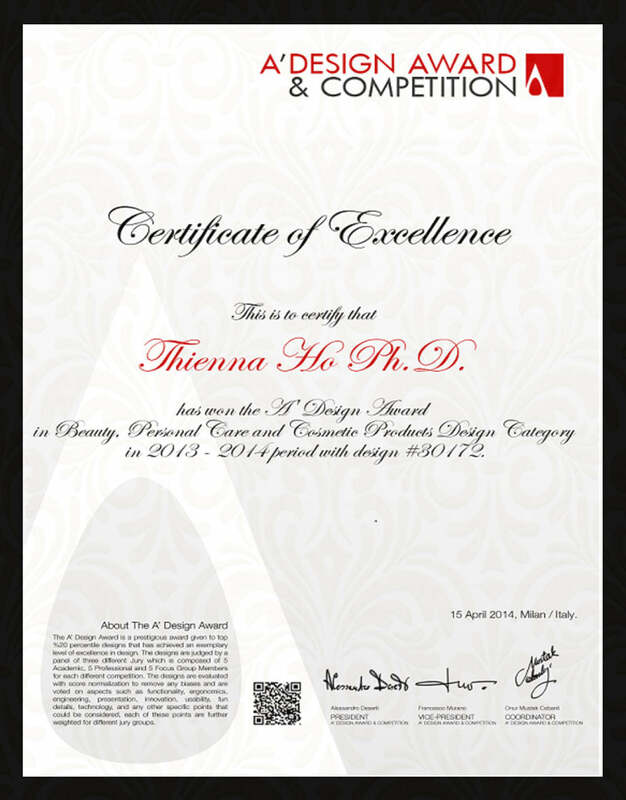 Winning the A' Award is a certificate of excellence for designers, a proof of quality for companies. Candylipz Xtreme Lip-Shaper System will be exhibited in the Museum of Outstanding Design in Milan, Italy. 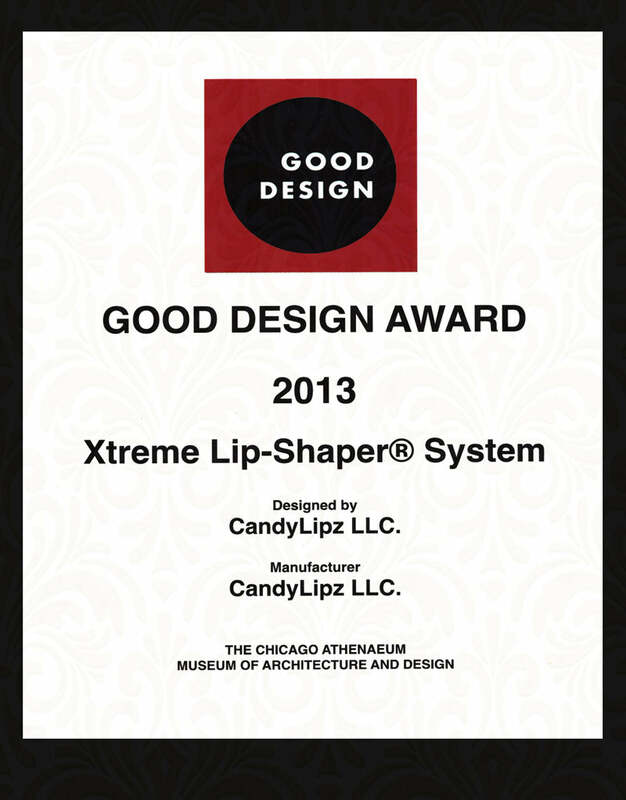 12.2013: NEWS: Xtreme Lip-Shaper System Wins GOOD DESIGN AWARD 2013 from Chicago Athenaeum Museum of Architecture and Design! Founded in Chicago in 1950, GOOD DESIGN remains the oldest and the world's most recognized program for design excellence worldwide. Awarded corporations represent some of the world's most visionary FORTUNE 500 companies: 3M Company, Apple, Inc., Alessi SpA., Allianz Deutschland AG., Allsteel, Anheuser-Busch Companies, Inc., ASSAABLOY AB., Armstrong World Industries, Audi AG., BMW AG., BODUM AG., Bombardier Transportation, Bose Corp., BSH Home Appliances Corporation, Chevron Corporation, City of New York, Commerzbank AG., Crown Equipment Corp., Daimler AG., Deutsche Bank AG., Deutsche Bahn AG., Deutsche Telekom AG., Et6n Corporation, Electrolux Major Appliances, Festo AG + Co. KG., Gigaset AG., Haworth, Inc., Hewlett-Packard Co., HTC Corporation, Hyundai Motor Corporation, Interface, Inc., Kia Motors Corporation, Knoll Inc., KONE Corporation, KPMG AG., Krueger International, Inc., LG Electronics, Lenovo Group Ltd., Logitech International SA, Lufthansa, Medion, Mercedes-Benz, Merck KGaA., Milliken & Company, Inc., Motorola Solutions, Inc., OS RAM GmbH., Rado Watch, Robert Bosch GmbH., Porsche AG., Royal Philips Electronics N.v., Samsung Electronics Co., Ltd., Sanofi-Aventis Deutschland GmbH., Seagate Technology Pic., Smeg SpA., Stanley Black & Decker, Inc., Steelcase, Inc., Tandus Flooring, Inc., Tupperware Brands Corporation, Vestel Electronics Co., VitrA, Vodafone D2 GmbH., Volkswagen AG., World Kitchen, LLC., and hundreds other leading companies synonymous with GOOD DESIGN. Thienna is proud and humbled to accept this incredible award! 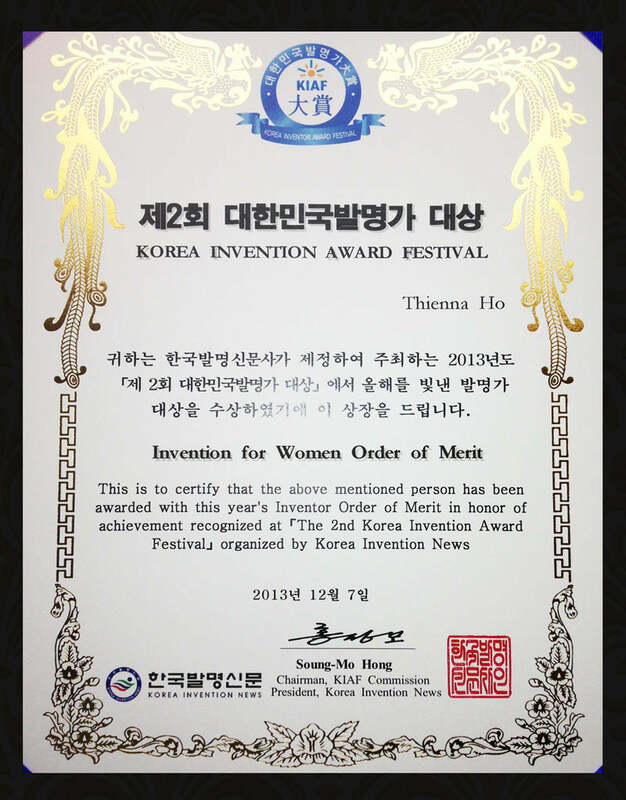 Thienna wins Woman Inventor of 2013 in Seoul, Korea at the Korea Invention News (KINEWS)! Her invention has been recognized for success and high achievements, contributions towards society, national competitiveness and for development of numerous industries. 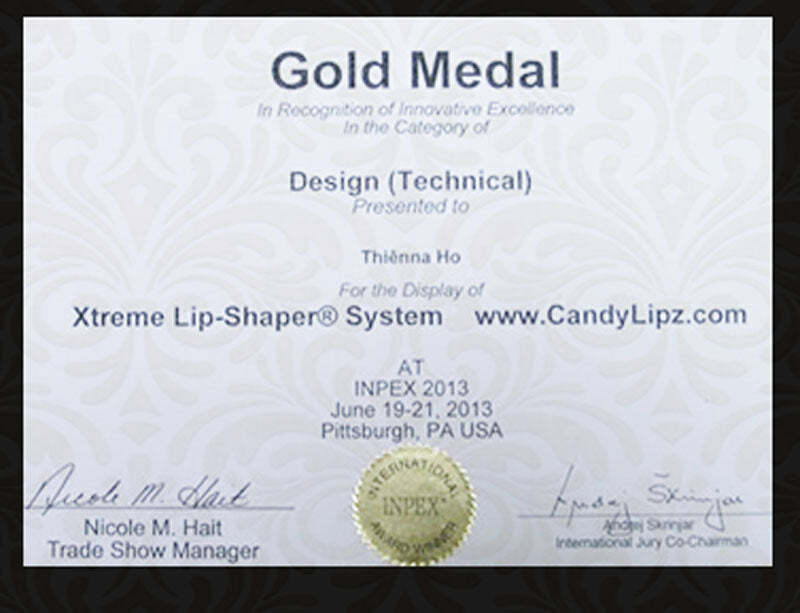 06.2013: NEWS: CANDYLIPZ WINS PRETIGIOUS GOLD MEDAL AWARD FOR TECHNICAL DESIGN AT AMERICA'S LARGEST INNOVATION EXHIBITION! Full lips are the hallmark of youth, beauty, health, sexuality, and fertility. Not many of us are born with beautiful, full, plump lips. Even worse, after the age of 18, our lips start to thin out, flatten, and lengthen. By the time we reach the age of 65, we can lose as much as 75% of our lip volume, shape, and contour. Candylipz invented a 100% natural method to enlarge the appearance of the lips instantly using suction with our exclusive built-in advanced lip-shaper technology. Using this latest technology, CandyLipz can enlarge the lips without surgery, lip injections, or chemical-based lip plumping products. The CandyLipz lip plumper contains 2 elements: 1 ) it uses a suction element, adapted from a 3,500-year-old Chinese 'cupping' method, to enlarge the lips. 2) To give the lips a smooth plumping effect and beautiful lip shape, the lip plumper contains a BUILT-IN advanced lip-shaper technology which allows users to shape, contour, and enhance the appearance of lips instantly and beautifully. CandyLipz is designed to work on 15 anatomical zones of the lips and it can produce 2 lip styles: the POUTY LIPS look of youth and the double-lobed lower lip. * The lip-shaper can create single-lobed and double-lobed lower lips. * Users may work on the upper or lower lip together or separately. * The lip-shaper has been engineered to raise the arches of the Cupid’s bow, create the pouty lips look, and lift the corners of the mouth. * It takes just two minutes to apply to the lips and the look lasts for 2 hours. * The suction lip plumper is used hands-free so multitasking is a breeze. * It is small, cute, and portable- disguised as an apple so users look like they are eating an apple while using the lip pump. * Users get to control their own lip size from subtle to extreme! * CandyLipz has been clinically proven to increase lip volume for shorter and long -term use and it is safe for lip enlargement at home. Lip filler injections are popular procedures for lip enlargement. The costs start from USD $500 and can run as high as USD $2,000 a session. For patients who want their lips to appear extremely large, the more expensive the treatments get. Lip fillers may last between 3 to 6 months. Thus, patients must return at least twice a year to maintain their look. Not many of us can afford lip injections and many of us want those luscious, plump, youthful lips. According to the American Society of Plastic Surgeons, in 2012, nearly 2 million people in the USA have soft tissue injection fillers. These were individuals who had money to spend. The number of people who do not have the money to spend for lip injections could be astronomical globally. The lip care segment in the USA brought in USD $3 billion in 2012- this segment includes lipsticks, glosses, gels, lip balms, and lip liners. All these tools are used as tricks of the trade to help enhance and enlarge the appearance of the lips. Cosmetic lip injections and lip care products are expensive and the possible side effects of lip injections may include scarring, lumps, nodules, pain, swelling, bruising, and asymmetrical lips. Many lip plumping products may not be everyone’s cup of tea as they burn, sting, and irritate the lips to enlarge them! These chemicals may not be healthy for the body if applied on a daily basis. Today, CandyLipz makes it possible for everyone to have incredibly beautiful and full lips at an affordable price and there is no known risk associated with using suction tools for lip enlargement. It is a one-time buy for the cost of a nice pair of Jeans. CandyLipz is A-ONE-OF-A-KIND lip plumper product, found nowhere else on the marketplace. Thank you for visiting CandyLipz.